June — 2011 — St. Finbarr's A.C.
Due to the re-fixing of the County Senior T&F Championships 2011 (Fri 8th Jul), the Cork Graded T&F Meeting originally scheduled for Sat 9th July has been moved to Sat 23th July. 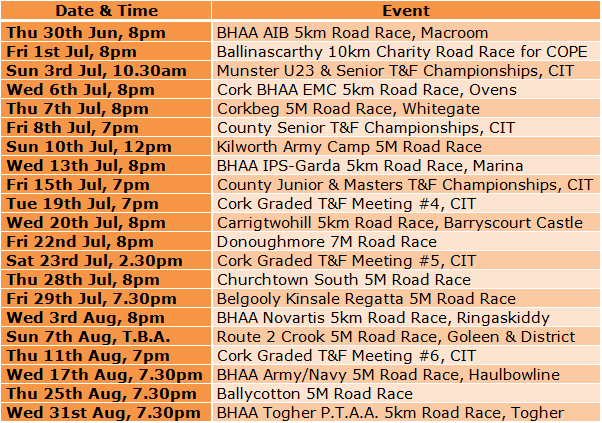 Therefore, the remaining dates for the Cork Graded T&F Leauge are as follows. Entries for the County Junior, Senior & Masters T&F Championships 2011, originally scheduled for Sun 29th May, are to be considered null and void. Club members wishing to participate in the re-scheduled County Senior T&F Championships (Fri 8th Jul) and County Junior & Masters T&F Championships (Fri 15th Jul) must submit new entries for their chosen events. Cathal O Donovan was 4th just the day after his Shanagarry 5 performance! Incredible stuff as he ran 35.07 which is 5.39 pace. In the ladies race Eileen Buckley was 4th home in 44.05. Sandwiched between Cathal and Eileen was Darren Mulcahy. Darren finished 19th in a very good performance in a time of 41.10 (6.36 pace) which was 1.45 better than his Dunmanway 10k time the previous week. Brilliant performances in this race left the mens team 2nd and the womens team 3rd. Performance of the week though went to Cathal O Donovan who was 4th in 27.14. A fantastic run that had him finish ahead of Cathal O Connell and John Meade who were 5th and 6th. In a performance to rival Cathal, Claire McCarthy put in a very strong run to win the ladies race in 29.59. Claire has now won both of the Ballycotton 5 series races run so far and having finished 2nd in the Cork Half Marathon is showing just the form she needs in her preparation for the Dublin Marathon. While those were the stand out performances mention should also be made of mens captain Paul Gallagher, in his first race back from a bad cycling injury, who raced well for 21st position in 29.17. Just an update on the result of this race. Cathal O Donovan was 5th in 21.52 in an excellent run. Well done Cathal! The third in this popular summer series of six graded T&F meetings takes place next Wednesday evening the 22nd of June at 7pm at the CIT Track in Bishopstown. Admission is €5 and the graded events are open to athletes of all levels of ability. Come early. Well done everyone on the fantastic performances. The weather conditions were near perfect and it resulted in some great achievements in the full, half and team relay events. In the Marathon Cathal O Connell was 8th overall in 2.33.57 (just 24 seconds off 5th!) and was first in M45. Mary Sweeney was another category winner in F50 and Margo was 3rd in F40. These are all provisional results. We are also waiting on confirmation that Margo broke the world marathon talking record! In the half marathon John Meade came 2nd with a great performance in 74.10. James Cosgrave was 4th overall and was 1st M40 in 76.39. Claire McCarthy was 2nd in the ladies half in a time of 80.48 finishing 9th overall. This was another brilliant performance from Claire who is showing some great form at the moment. Orla Crosbie put in an excellent performance to finish 2nd F40 in a time of 1.36.51. These are also provisional results. In the team relay Martin McCarthy was part of the first team to finish while St. Finbarr’s AC floaters were 8th overall in 2.45.20. The team was made up of Patrick Rahilly, Karina Teahan, Neil Murphy, Brian russell and Aidan O’Gorman. Here are the provisional results. If I missed anyone let me know as I had to go through the program to extract the Barr’s runners and the club wasn’t listed for everyone. There were some top performances in the first meeting recently in CIT. Cathal O Donovan won the B 3000 metres leading from start to finish. Our own Kevin Coleman started to reel Cathal in towards the finish but a final kick by Cathal meant he held on to win by 2 seconds. Michael Murphy, Stephen Geoghegan and Martina Kiely made it a Barr’s top 5. Behind them Michelle Nolan, Eddie Barry, Orla Crosby and Tony O Brien filled 8th to 11th positions. Cathals performance came just a day after finishing 2nd in a cycling time trial so a great two days for him! Overall the club lies in 3rd place after this round.